Searching for corals where they shouldn't be found has become an urgent quest for marine biologist Dr Emma Camp. As the impact of climate change on the world's coral reefs grows in frequency and intensity, the options for reef management are becoming more and more limited. Scientists such as Dr Camp, a member of the Climate Change Cluster (C3) at the University of Technology Sydney (UTS), think hope lies in identifying "hot spots" of coral resilience. In 2016 an expedition to a remote lagoon system in New Caledonia yielded surprising results. A diverse community of reef-building corals had adapted to thrive under extreme conditions – hot, acidic, low-oxygen waters associated with mangroves – and showed there may be a way for corals to adapt and survive in a warming world. The discovery, a joint venture between UTS and International Research for Development, Noumea (IRD), was recently published in Scientific Reports. "The existence of corals living under this usually deadly trio of conditions, comparable and even exceeding what is predicted under climate change, gives us new hope that some corals will be able to persist into the future," Dr Camp said. 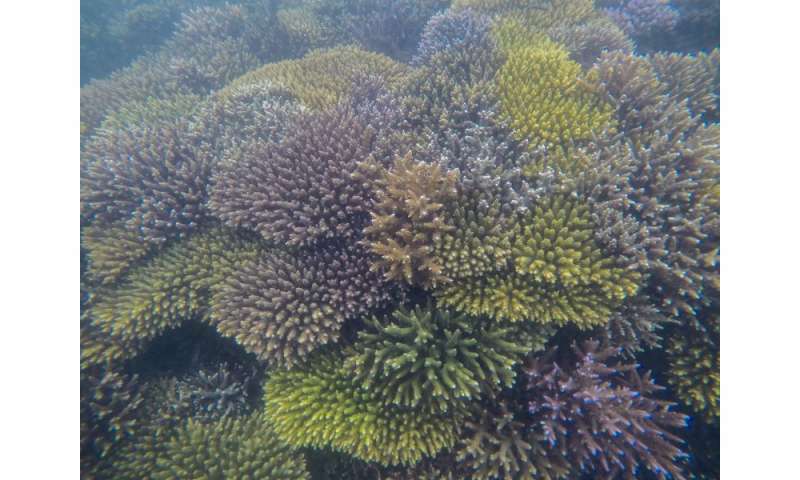 "These could indeed be the super corals of the future that will help support proactive management options attempting to upgrade reef resilience." Dr Camp will now turn her attention to Australia's Great Barrier Reef, previously uncharted for mangrove systems housing corals, thanks to a grant from the National Geographic Society Waitt Foundation. She said the exploration grant provides a unique opportunity to bring together a multi-disciplinary team, using state-of-the-art technology, to discover the prevalence of mangrove habitats around the Great Barrier Reef. Dr Camp said citizen science will play a crucial role in providing local knowledge on the five-day expedition voyage from Port Douglas to Lizard Island. The expedition team will use detailed water chemistry analysis to identify the extremes to which Great Barrier Reef coral populations have adapted. National Geographic support also makes possible DNA sequencing of the corals' essential microbiome. "As a result of the expedition we will be able to collect invaluable baseline physical and molecular data to discover how corals within the Great Barrier Reef have already adapted and how they might cope in the future," Dr Camp said. "I'm excited at the prospect of being able to transfer our discoveries from other sites to our own home reefs. I could not do this without the support of National Geographic." Dr Camp is a member of the C3 future reefs research program and will be accompanied on the expedition by program leader Associate Professor David Suggett. "Quite simply, this is pioneering science," he said. "By exploring the very margins – such as reef-neighbouring mangroves that are often ignored by coral surveys – we're continually finding populations of super-coral that are resistant to hot, acidic and hypoxic conditions predicted under climate change. This is a game changer for how we consider coral reef resilience into the future for the Great Barrier Reef." However, the researchers are under no illusion this offers a quick fix for reefs and their ecosystems. "Although our findings are extremely positive, we must not underestimate the threat to the world's coral reefs from climate change," Associate Professor Suggett said. "We know reefs are terminally ill globally and immediate action is needed to ensure their success."